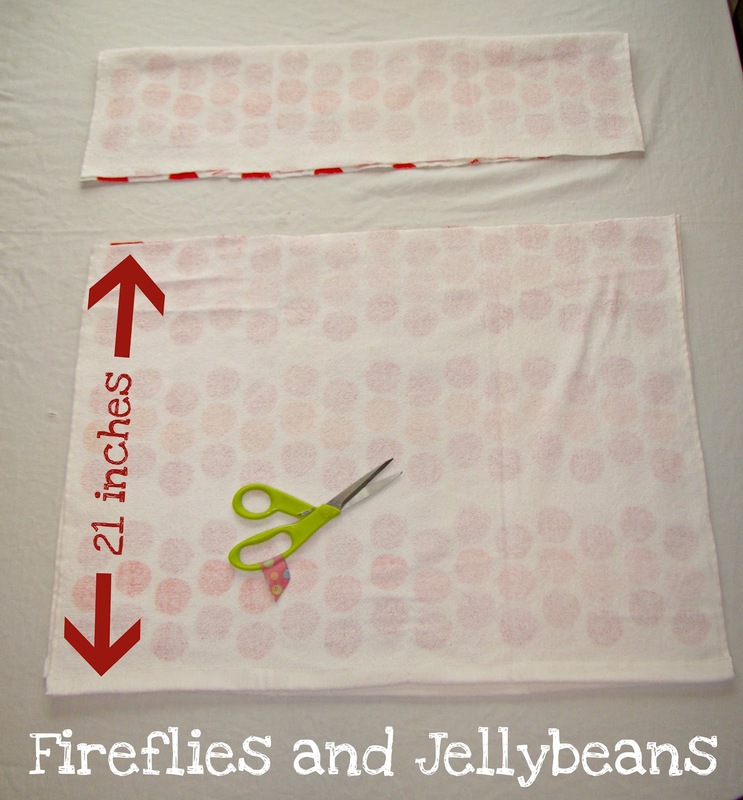 Fireflies and Jellybeans: Hooded Poncho Beach Towel Tutorial! I wanted to get this project ready so that you have lots of time to make it for summer! This is such an easy way to make a beach towel into a hooded poncho so that your kiddies stay warm at the beach and pool! 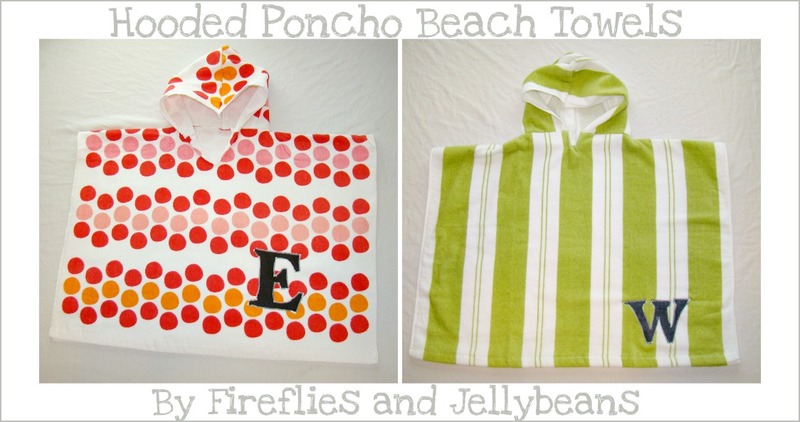 This hooded poncho beach towel will fit kids 1 -4 years old. 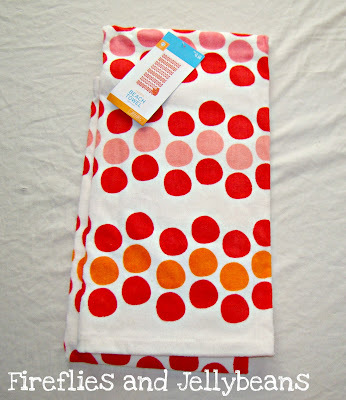 I got my towels from Target. They have some cute ones for boys and girls! 1. fold your towel in half horizontally with RIGHT sides together. Cut off the top part so that you have 21inches left on the bottom part. Save the top part for later when we make the hood. 2. 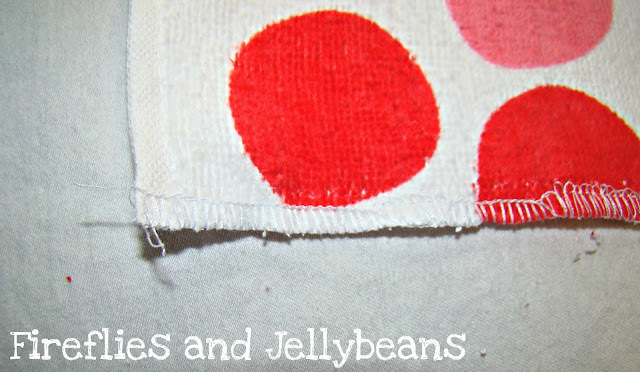 Finish off your edges either by using a surger or a zig-zag stitch. 3. We are going to create the opening for the head. With your 2 bigger bottom pieces right sides together fold it in half vertically. Mark with a pin at 5 inches from the fold. 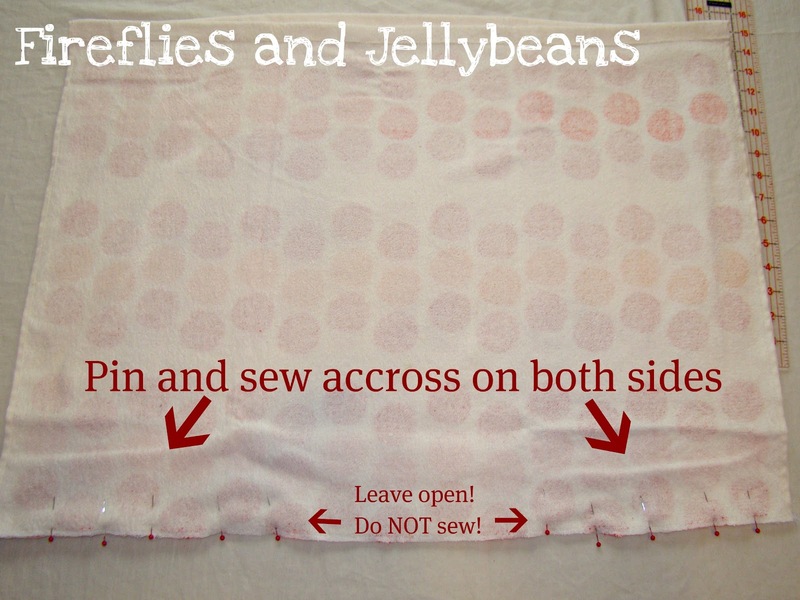 Make sure that you make both sides of fold by pinning the top 2 layers together and the bottom two layer together (see picture below). 4. Open your towel up and pin out to the ends of the towel on both side... leaving the middle part open for the head hole. Sew on both sides where your pinned but leave the head hole open! 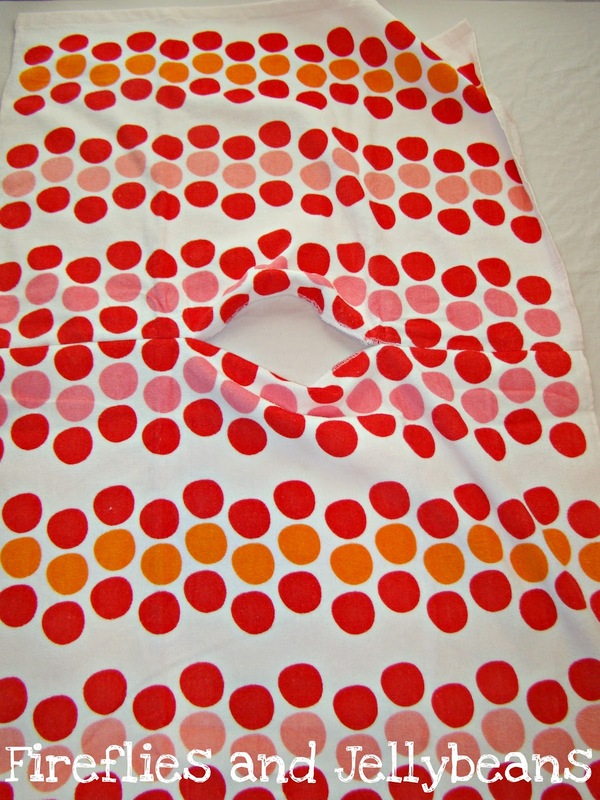 Now it should look like this when you open it after you sew. 5. Now we are going to make a hood out of the part we cut off earlier. fold the piece so that the finished edges are on the end. 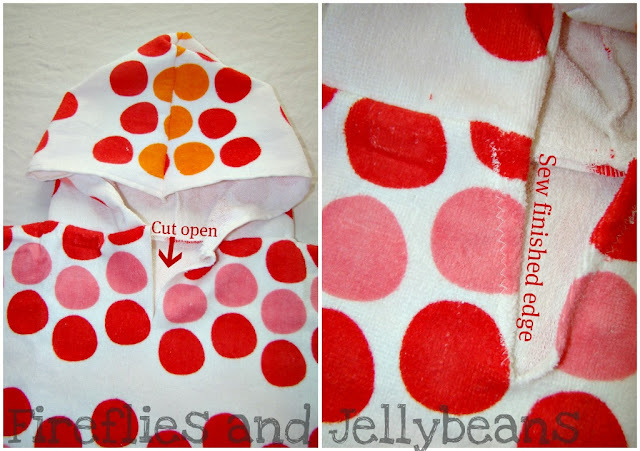 Cut out a hood shape (use a hoodie sweatshirt or other hood for a template). Pin and sew around the curve of the hood. 6. Pin your hood to your head hole, lining up the middle part first and pinning out from there. Make sure that you have RIGHT sides together. 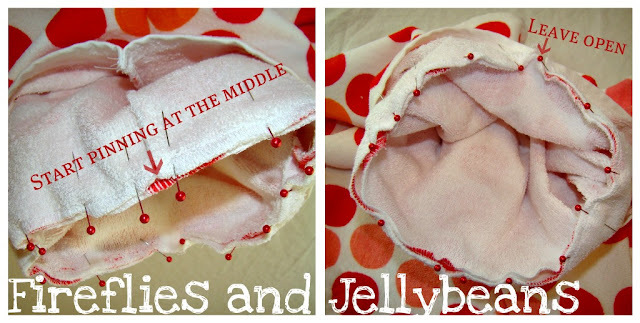 Sew all the way around leaving and opening where the ends meet. 7. Optional V-neck. My son has a HUGE head (90th percentile) so I always create a v-neck to make sure the head hole is big enough (obviously this is NOT for my son... I just do it for everyone!). Cut a slit a couple inches down the middle of the neck line of the front layer of the towel. 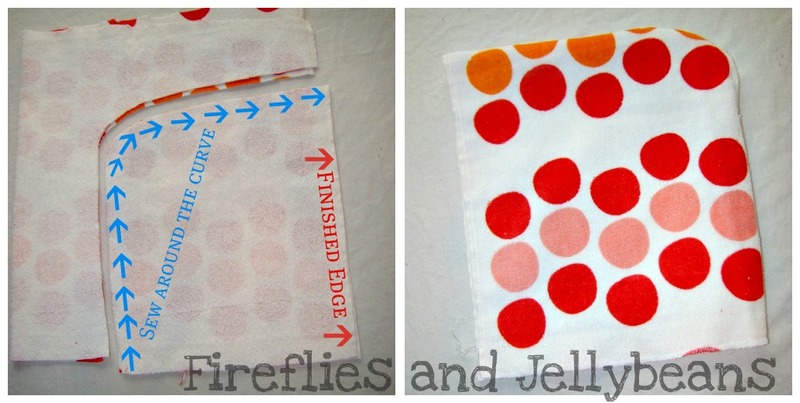 Fold over and sew for a finished edge (I used a zig-zag stitch). 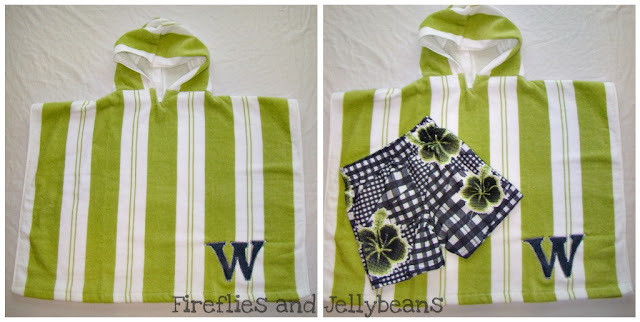 Sew on a monogram applique and add some matching swimsuits for a cute gift! Here is my son modeling the girl towel because I forgot to get a picture of the boy one before I gave it away! Oops! 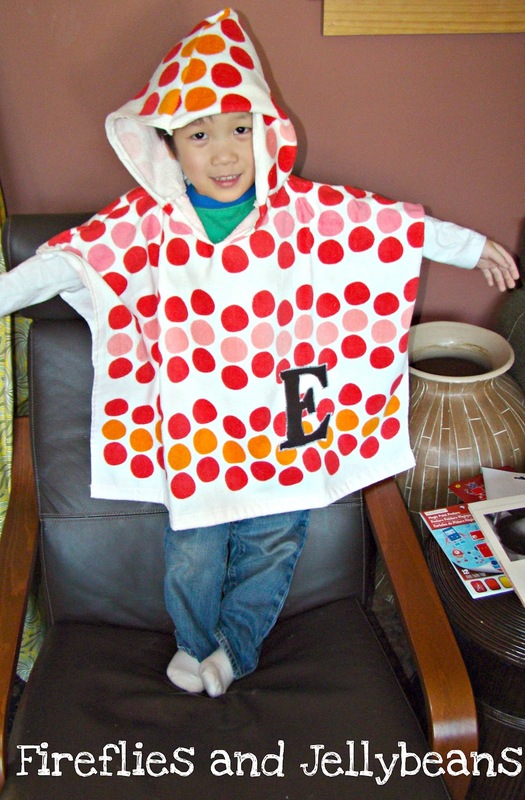 My son is 4 years old and is average height and weight (50th percentile for both!) for a reference for size. These two were gifts to two special and cute 1-year-olds! I need to make some for my own kids now! This is a really great project! The detailed instructions are fantastic. I would love it if you would come link it up at my Pinworthy Projects Link Party. those are great! :) and so easy! These are so cute! Perfect for the beach! Thanks for sharing. I love this! I am going to make these ASAP! I LOVE the hooded towels! Thanks for a great tutorial!! I would love for you to share it at my party going on now at Jillify It! Than you for this. It's exactly what I was looking for. I recently started taking my kids to the YMCA and my wee one gets soooo cold. This will be perfect! I'm only a beginner sewer but this tutorial looks great! Do you think it would work using 2 towels to make a longer one for my 5 yr old & very tall 7 yr old? I'd still have to cut some off the top which could use for the hood.